certainlyrepaint a chair ... once or twice or maybe 20 times! Not this chair, but maybe a couple others are about to get a simple, new look. Looking for a really rustic, distressed French Blue look? Try this method. Only a few years ago stores such as Pier One offered imports from countries like Italy instead of all the more cheaply made goods from China. If something is made in China, I try first to find something made in our country that has contributed to jobs here, then any other country than China, and if nothing else can be found, I'll buy something made from there. As consumers we could change the economy for the better if we spent a few cents or dollars more to buy made in the US first. At least we have a choice. These French style chairs made in Italy are an excellent quality, useful as a side chair, and but not too comfortable. I still love their look. They began as a white wash finish, I redid them to look like wood, and as you see in the picture they were redone to a very distressed look. They have since been painted again to a simple white with a touch of distressing that you can see here with a tutorial on how to change out the seat. The color was Old White with some flat white added for a less "yellow" white. Painted first with medium turquoise blue color. 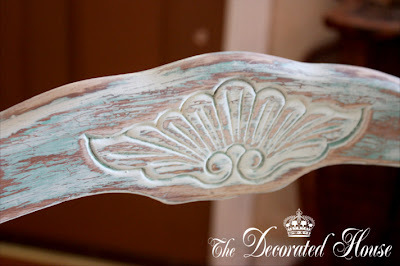 I used a mix of Provence chalk paint with Turquoise (flat turquoise acrylic paint, not ASCP) added. Dry Brushed with ASCP Paris Grey mixed Provence. Rubbed with a damp cloth. This is like a gentle sanding. It will remove some of the chalk paint before it has days to really cure. This gives you a very smooth distressing without the dust. Dry brushed with Old White chalk paint * and some light waxing. Sanded to distress. This can be a lot of sanding. Some of the sanding went down to the original wood which I like. But as you can see you can control the amount of sanding to expose the differ colors beneath your top layer. it was too much shabby for me. Now it is painted with Old White. Yes, after all that work, I painted over it. I love all the layers of colors! I just got a sample size of Provence to try, Donna. I like the way it looks with the dry brushing of the other colors on top. I love that you can change the paint as you change your style!!! Totally agree with trying to buy American made products!!! Lovely chair!!! The chair looks great but I know what you mean by sometimes being too shabby for our taste. I am still hesitant about painting several of my pieces as I wonder how long this look will be in style and think a beautiful wood finish really is a classic and one that lasts over time. I love your pretty succulent container in your previous post too! I agree with about the too shabby look. I also agree with trying to buy products made in the USA. We try to only buy them from here. I am not going to support China. What a beautiful chair, love the layers of color. It's wonderful how a little paint can completely change the look of something, nice job. Love, love, love it too! 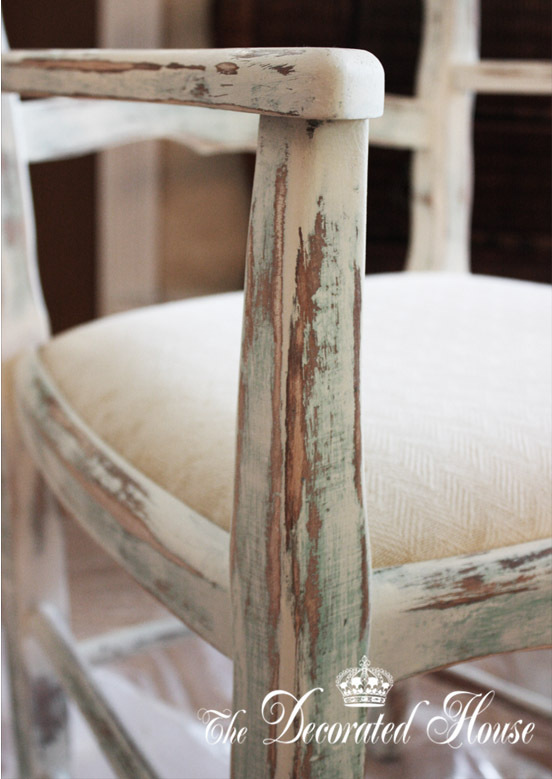 Love this chair and all the layers you used...Beautiful!